As nice as the Apple iPhone is, it poses a real challenge to its users. That's according to Research in Motion's Mike Lazaridis, who has said that real phones need real keyboards. 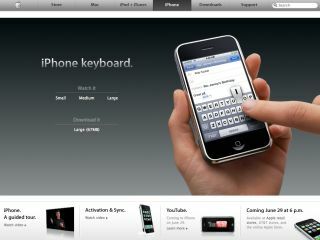 The RIM CEO told reporters: "Try typing a web key on a touchscreen on an Apple iPhone, that's a real challenge. You cannot see what you type". He added that he's not too impressed with the Apple iPhone, and that it won't kill off the Blackberry, The Register reported. Blackberry has some 20 million users globally and is currently the eighth biggest phone maker in the world. "The Apple iPhone has severe limitations when it comes to effortless typing. Of course you have more screen space, with more artistic interactions, but that's not enough. We've seen this before when Palm tried virtual keyboards. When they launched the Treo they licensed our keyboard," Lazaridis said. However, the launch of the Apple iPhone has meant increased sales for other smartphones too, something that Lazaridis is extremely grateful for. "Apple undeniably accelerated the drive to smartphones. It educated the consumer to the benefits of these types of phones. We saw our sales go up with AT&T after the Apple iPhone came out." Apple's archrival Microsoft isn't a great threat to the Blackberry either, according to RIM's co-CEO Jim Balsillie.
" Windows Mobile isn't that big a competitor," he said. "They are a modest force to RIM. Microsoft should be working at services, not at distributed PCs, which is what Windows Mobile actually still is."